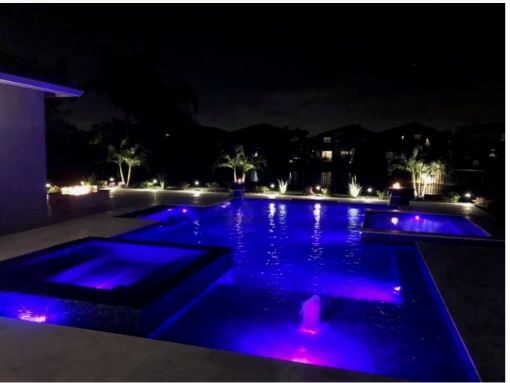 Treasure Pools is a premier Boynton Beach Pool Builder and recently worked with the owners of a gorgeous home in Boynton Beach to add their dream swimming pool to their backyard. This stunning pool is equipped with many great additions that the homeowners and guests will be sure to enjoy! One of the truly unique features is the 18 inch deep kiddie pool that is situated on the right hand side of the pool. Safe area for kids to enjoy while still being able to swim. However, note that adult supervision is always required! In addition to this kiddie pool, there is a 360 spillover edge with a large sunshelf as well. This area is great for guests to lounge or even another area for kids to enjoy. The granite table top swims up, equipped with barstools is truly amazing and great for entertaining! No need to get out of the pool to enjoy a beverage or meal, just swim right up and take a seat. There is also a brand new outdoor kitchen that includes some great features such as a grill, smoker, refrigerator and sink. Outdoor kitchens are the key to seamless entertaining. No need to leave the party to get things ready, everything is right there in your idyllic backyard. Lastly, each back corner of the swimming pool has gorgeous fire and water bowls. You can use either feature, depending on the setting, time of day or preference. They are definitely show stoppers. Everything is completed with a pebble finish to this 20 x 40 foot pool. Treasure Pools was thrilled to help this homeowners pool come to life and we would love to do the same for you. Contact us today or stop by our showroom to learn more!